How much does it cost to size or resize a ring up? Ring resizing up starts from $35 + plus shipping and can go up depending on the type of metal and/or the number of sizes. How much does it cost to size/resize a ring down? For most metals its just $35 to resize a ring down 1 or more size (plus shipping) however, we do encourage you to reach out to us if you plan on going more than 4 sizes down. Can stainless steel rings be resized? While most jewelers will tell you they can’t resize stainless steel (siladium), Quick Jewelry Repairs has the equipment and experience allowing specialize in working with stainless steel. It will take us an additional three days to work with stainless steel, due to the nature of the metal. – Stainless steel rings with colored finishes and textures are sizeable but will show noticeable signs of work after the upsizing process. – We do not size up stainless steel rings with inlay, as the process will permanently change the integrity of the ring’s design. – Stainless steel rings with colored finishes, textures, and inlay can be sized down via alternative methods such as sizing beads and silver lining. Can channel-set rings be resized? We can definitely size rings with channel-set stones; however, please note that the resizing process may loosen the stones. There will be an additional stone tightening fee per stone after the resizing work. 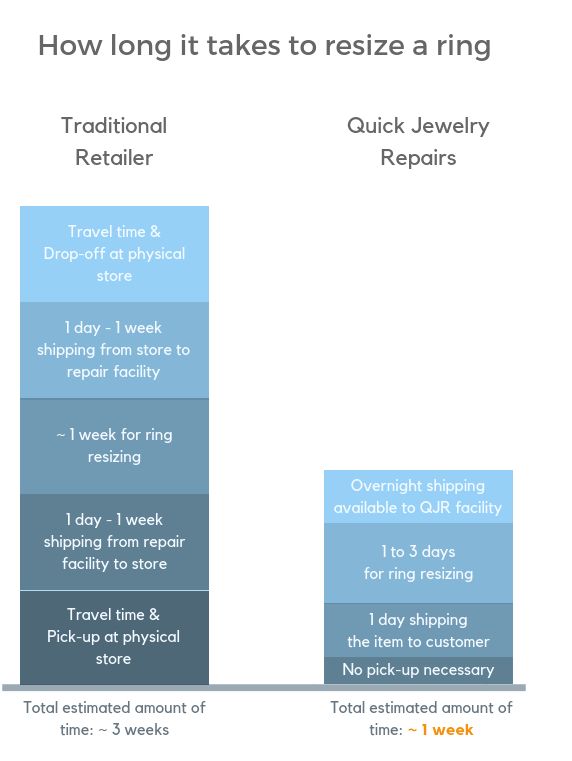 Where do you ship jewelry to? 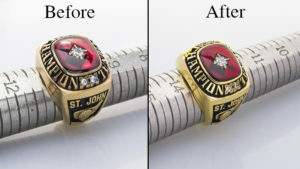 We ship orders anywhere in the US so you can be sure we’ll resize your ring no matter your location. The total time depends on your location and the shipping option you choose. Both options covers the round-trip cost, first to our repair facility, then shipping back to you when the service is complete. Once we receive your jewelry our turnaround time is quick and our usual turnaround time is same day at maximum 1-2 days for 90% of repairs. What type of metals can be sized/resized? Have something else? Drop us a line and we will let you know if we can size it. Please note; we do not return scrap metal! Nope! We don’t do sizing or resizing for titanium at the moment. Can bronze, brass or copper rings be resized? Yes however it depends on a few factors so we would need more information to let you know for sure. What type of metals can NOT be sized/resized? Not sure what metal you have? Send us a message we are happy to help. What type of rings can be resized? That’s just the short list, we’ve worked on them all. Can a ring with engraving be resized? Yes! In most cases our jewelers will be able to resize around the engraving so you won’t have to worry about losing that special message. What if I want to edit my ring size after I've placed my order? No problem! Before we do any work, orders can be changed. Just get in touch with us and we will adjust accordingly. If the new size difference is significant, there may be an increase in price- we will contact you before doing any of the work. If you need to resize a ring up or down but don’t know what size you need it, there are a few ways to DIY your ring size. If you already have a ring that fits you already, just check out our ring sizing guide here. Print out the page, place your ring on the sheet, and obtain your ring size that way. If you don’t have a ring to find your size, the sheet has a quick how-to on how to find your ring size using a strip of paper and your finger. To learn more about ring resizing, check out our article here. Our ring resizing service is available to anyone in the US and our pricing starts at $35. Whether you need to resize your ring up or down, we’re happy to help. And remember, all resizing services come with a complimentary Jewelry Spa Service so your ring will arrive in its best condition. Order from the comfort of your own home and remember, over 90% of our orders are have a turnaround time of 1-2 days! Get started with sizing down or sizing up your ring today.